Overgrown Path's web logs over the past few days showed little uplift in traffic to my wide range of Herbert von Karajan articles. Most of the increase that happened came either from searches for the conductor's political and sexual predilections or from Japan, which has always had a special love affair with him. This analysis was mirrored in the mainstream media where, despite strong promotion from Deutsche Grammophon and EMI and some unashamed puffery from Simon Rattle, there was little interest in the Karajan anniversary other than tabloid-style trash from Norman Lebrecht and Ivan Hewett. The music industry loves an anniversary and two years ago we celebrated Shostakovich to death. So why did Herbert's birthday party fall so flat? Many will say it was because of Karajan, but I disagree. Love him or hate him Karajan was a very high profile conductor who has never struggled in the past for column inches. Nobody came to the party this week-end because our love affair with the conductor is finished. The twentieth-century was the age of the maestro, and the big industry names held a baton - Walter, Toscanini, Furtwängler , Karajan, Boult, Beecham, Barbirolli, Klemperer and others. But as the millenium approached new names emerged, and they were holding a pen instead of a stick. The three 'Bs' of Britten, Bernstein and Boulez were on the cusp, and they have been followed by Stockhausen, Reich, Adams (header photo), Maxwell Davies, Adès and many more. Crucially, a number of these composers are, or were, fine conductors not just of their own music but also of composers as far back as Bach. 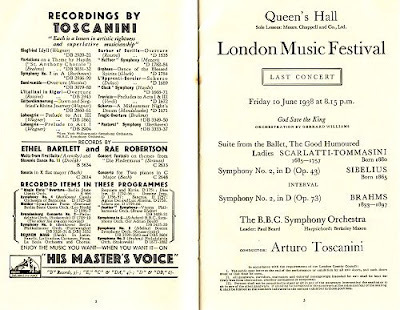 As we say goodbye conductor and hello composer major festivals such as the 1938 London Music Festival built around Toscanini (programme above) and the Salzburg Easter Festival created as a vehicle for Karajan have become things of the past. 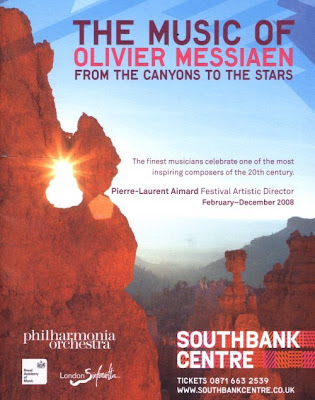 Their replacements are events like the South Bank Centre's Messiaen celebration (poster below), and try finding the conductors (one of who is Pierre Boulez) on that poster. None of this means conductors will disappear. Orchestras need them just like they need concert masters. 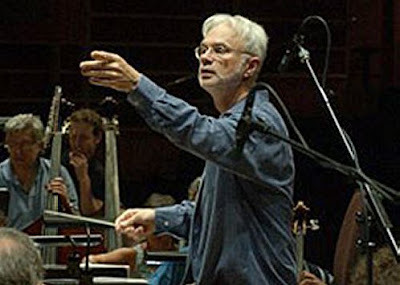 But how many readers can name the concert master of the Los Angeles Philharmonic? The celebrity conductor is a dying breed and it is interesting to speculate what that means. The record companies (again) stand to lose most as they depend on personalities to sell CDs. It is almost impossible to get composer/conductors such as Thomas Adès to work the press. Which explains the increasingly shrill attempts to promote increasingly young conductors who are only too willing to co-operate in photo opportunities. When they finally read the writing on the wall (which will probably take as long as it did for them to realise the impact of MP3s) will we see labels signing exclusive deals with composers instead of conductors? And before anyone tells me that contemporary composers don't sell I'd remind them that Naxos' second best selling album in 2007 was Philip Glass' Symphony No. 4 (23,000 units) and the fourth best seller was John Adams' Piano Music (14,000 units). Remember that it took four years for Glenn Gould's 1955 of the Goldberg Variations to sell 40,000 units. Will we see back catalogue exploitation of neglected conductor/composers of the past such as Antal Dorati? Will we see Thomas Adès recording Mozart concertos directing from the keyboard, and Peter Maxwell Davies recording Mahler and John Adams Beethoven from the podium? Will more composers follow the example of Philip Glass (Orange Mountain Music) and Peter Maxwell Davies (MaxOpus) and establish their own record labels? Your guess is as good as mine. But it is definitely goodbye conductor and hallo composer. Watch this space. Read more about an artist extraordinaire here. All hail the composer-conductor! Now that Richard Strauss is firmly ensconced as a composer, will the same happen for the afore mentioned Antal Dorati, or even Rafael Kubelik, or Otto Klemperer? The REAL candidate for that should be Wilhelm Furtwängler. His 2nd Symphony gets occasional praise, but his chamber music is very good as well. "So why did Herbert's birthday party fall so flat?" Pliable, thank you for this fascinating article, as well as several additional recent very important articles and posts. I also wanted to report that I heard James MacMillan conduct his own 'Stomp' and 'Piano Concerto #2' (with Rolf Hinds) with the Baltimore Sym. last week, and that Thomas Ades is due in for a Baltimore Sym. concert next month featuring him conducting his Violin Concerto and Beethoven #1 and 4. (MacMillan also did Beethoven Sym. #2). John Adams's 'El Nino' also makes a delayed appearance in the region next month (but not under Mr Adams). Garth, thanks for adding James MacMillan to the growing list of composer/conductors. I have been meaning to include Veni, Veni, Emmanuel in my Future Radio programme, thanks for the reminder. That Scottish link to composer/conductors reminds me that Peter Maxwell Davies is a great Gilbert and Sullivan fan. When Christopher Bishop was running the Royal Scottish National Orchestra he gave Max a G & S concert, and a great time was had by all. It's a programme that another orchestra should pick up. Is it cheating for me to know that Martin Chalifor is concert master of the Los Angeles Philharmonic given that I live here? And speaking of a rush to promote young conductors... Given the unquestioning media love-fest around our next music director, Gustavo Dudamel, Mr. Chalifor's prodigious skills may be needed more than everin these parts. As for conductor-composers, Felix Weingartner was excellent, better than Furtwangler imo. Really something worth hearing. Hahaha, beat me to it. Brian, did you go to any of the Debussy/Bartok/Ravel concerts this past weekend? It's the fourth time I've heard Mr. Dudamel conduct and I have to say, I walked out of Disney Hall blown away. I didn't like the Simon Bolivar YO concert --the Mahler 5th was awful, IMO-- and didn't really like the Symphonie Fantastique from a few weeks ago, but damn! the concert on Saturday night just had *it*. I loved how he conducted the Debussy and Ravel, no washes of amorphous sound, but very rhythmically alert and pointed. I thought he did a fine job accompanying Leila Josefowicz, who played the hell out of the Bartok second violin concerto. I do see the warning signs though: everything is pretty driven, there's not a lot of calm in the calm bits and there might be a tendency to go REALLY over the top in big tutti's instead of merely over the top, but on the whole, I'll sacrifice a bit of nuance for the thrills that compensate for that. The Kurtag is a fantastic piece.